It seems a decade or so earlier the marketing departments of a few perfume, cologne and deodorant companies had gotten together to find the world’s stinkiest person. The winner got a good scrubbing, a lifetime supply of deodorant and perfume/cologne, and a year of celebrity as the underwriters toured him (it was always a him) around the world and displayed him as their product’s latest triumph. They had such success that they made it an annual event. Dad walked right into the local competition and won handily with two sniffs of his garlic breath (one from each judge). For the regional competition he spent the morning mowing the grass in a sweat suit (it was July). He walked into the basement where it was being held and one of the judges ran to the bathroom with an acute case of nausea. They sent Dad through to nationals. Mom refused to drive Dad to the national competition as she’d been Lysoling her car daily for three weeks after the regional round. The competition got a lot steeper at the national round. There was a trash collector, a chicken farmer, a septic tank technician, a fertilizer manufacturer, and a guy who lived in his parents’ basement, just to name a few of the heavyweights. Dad smelled pretty bad when we got there, but not where he needed to be to win. Luckily he had an ace up his sleeve or, I should say, up his shoe. The first contestant to go, the trash collector, made the judge cough. The chicken farmer made the judge wheeze and tear up. Next came my Dad who’d taken off his shoes just before entering the box. Mom called them his “stinky cheese” feet. When the judge took a whiff of my Dad he fainted on the spot. They brought in a second judge (the need for alternate judges was common in this competition) and he fainted when he smelled my Dad too. A third judge started from the other end of contestants, but he too fainted when he got to my Dad. They declared Dad the National Stinker. They dubbed the guy who lived in his parents’ basement, Mike, second runner-up after the judges had been revived with smelling salts. They sent both Mike and my Dad to the world finals. 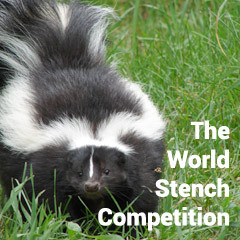 For luck (and training) my Dad decided not to shower until the international round had named the world’s stinkiest person. Mom was not so happy about it. Dad had to sleep on the couch for the two weeks before the competition in sheets Mom planned to throw away when he left. Synopsis: A boy's Dad finds his talent for being stinky actually has value. Bacontopia had been bought and named during another marketing stunt, this time by a food packaging company from Chicago. They eventually abandoned it for insurance reasons as the amount of bacon eaten by the average visitor was fourteen times the recommended daily limits set in place by the FDA. US law didn’t really apply there, but no insurance company was going to take that bet either. The eventual sale, however, gave the World Stench Competition cheap, out-of-the-way real estate, since no hotel, even ones desperate for business, would allow them to hold the competition on their premises. The plane ride went well except that every passenger within a 12 seat radius requested a flight transfer. That only left two other people on the plane, one took up a position in the bathroom to try to get away from the stench, and the other had a terrible cold and couldn’t smell a thing. Luckily, my Dad lets me hold my nose with a clothes pin when he’s competing or I might have tried to hole up in the bathroom too. The flight attendant did not come by with anything complementary. In the World Stench Competition finals, Dad wasn’t a favorite. There were two guys who hadn’t bathed yet–ever, a guy who had eaten a pound of Limburger every day since 1974, a man who cleaned diapers for a living, a guy who rubbed rotten eggs on himself every morning, a guy who was raised by wolves and the guy who actually made all the bacon when Bacontopia was in full swing. All the other contestants came alone, and, though I didn’t notice it then, out of thirty-some contestants none were women. In fact the only woman on the island was a nutritionist who consulted with contestants on keeping balanced nutrition while eating odor inducing foods. She survived by wearing a gas mask all day, every day, but unfortunately for her the mask didn’t filter all of my Dad’s stench. For two days each of the contestants prepared for their final test. Some contestants ate stinky foods, some took trash showers and some spent hours in the woods chasing skunks hoping to get sprayed. Skunks weren’t native to the island, but the WSC had brought them in for the further training of its contestants. A contestant or two tried bathing dogs in hopes the wet dog smell would come off on them, but this plan failed miserably. The wet dog smell didn’t stick to them and mostly they just washed their other odors off. Two men later went home in tears, knowing the decision had lost them their chance at the stink crown. The first day my Dad and I ended up traveling around the island and seeing the sites. We had a lot of fun at the Bacon Eiffel Tower, the Leaning Tower of Bacon, the Colossus of Bacon, the hanging gardens of Bacon, Mount Baconmore and Canned Meat Castle (I still don’t know why that was on Bacontopia). There were many other wonders of the world modeled in bacon too. Most of these were in imitation or plastic bacon, but the ones that weren’t helped with stench training. I urged Dad a few times to work on his training, but he told me not to worry about it and suggested we go see the Mona Bacon. My Dad knew he had to up his game, though, when, Mike, the man who lived in his parent’s basement, came back to the lodge that night and had been sprayed by skunks three different times. After a stinky food dinner, all the contestants sat around a campfire and told stories long into the night. Some told ghost stories from their homelands, some told stories of their stench talent and how they started, my Dad told a story about changing my diaper when I was a baby that made everyone laugh (even me). No one told any more stories for a long while after that. Most of them sat poking the fire or looking deep into the flames. Finally my Dad and I convinced another guy to talk. We went around the fire some more, then Mike re-told an epic poem by an old French poet. I don’t really remember the story, but I remember a warm and happy feeling while he told it, and that afterward a few men had streaks down their dirty faces. After that we all ran out of stuff to say and turned in for the night. The next morning, after a breakfast that included a variety of cheeses, baked beans and garlic, the competitors headed to their stench training. Several guys went for long runs and a few went to find the skunks as well as a population of bombardier beetles, stink bugs, and great fields of stink weed that were brought in to bring nuance and refinement to the various smells each contestant brought to the island. My Dad decided not to go for those, call him a purist, but he felt he could only claim stenches that came from his own body, not whatever happened to be sprayed at or rubbed on himself. He started a thorough exercise routine designed by the WSC trainers to increase sweating in glands that produced greater stench. He did that for a few hours, but he told me later his heart wasn’t in it. After that he came and found me. No contestant had ever brought anyone with them before so there was no planned activities or even space for me. When Dad found me I was poring over the trophy case of past winners, about the only thing on any of the walls of the buildings besides stains. He decided we’d go back to Mount Baconmore and check out one or two of the lesser bacon monuments. I tried to get him to think about the contest tomorrow but again he told me not to worry about it and suggested we catch the Bacon-iberty Bell too. I had a lot of fun with him that day, but near the end, while removing the clothes pin from my nose to scratch it, I noticed that his pungency was wearing off. I tried one last time to get him back into training. After some back and forth he finally agreed, but only if I’d go with him. We went to the gym and he worked hard on his stench. I was very proud of him. That night almost everyone went straight to bed. Only my dad and I hung out at the campfire, telling silly stories and jokes to try to make the other one laugh. After quite a few rounds we turned in too. The next day after a stinky breakfast we all went to the contest area. Like nationals they had a row of glass boxes where the judge could come and smell each contestant independently, but this time they had to put on special, freshly laundered jumpsuits before entering. This way you couldn’t hide a rotten egg in your pocket or use the skunk spray still on your clothes. The judge was a former perfume scientist who through a rather unfortunate lab accident had burned the inside of his nostrils and lost almost his entire sense of smell. He was not someone you could wow with just your unwashed body odor or even a couple of skunk sprays. You had to offer a combination of smells that together were more pungent and offensive than they were apart. In short with this judge you had to be a professional. He judged the competition in rounds, eliminating contestants quickly and ruthlessly. On the strength of both his body odor and his “stinky cheese feet” plus a few well-timed exhales of his garlic breath and a terrible burp, my Dad survived to the final round. Before they ran the final round, they took both remaining contestants (my Dad and Mike) out of their boxes to let the boxes air out and put them on equal footing before the final match. My Dad and Mike waited around, chatted and just sat. At one point my Dad got up and walked around for a bit. Just as he heard the announcement to come back to the blocks he heard the sound of an aerosol can, felt a misty cloud touch the back of his neck, and a sweet, acidic smell filled his nose. Air freshener. He whirled around and there was Mike, but Mike looked as if he had just come up. My Dad asked him about the sabotage cloud, but Mike just smiled and claimed to know nothing about it. He’d just been looking for a skunk and hadn’t seen my Dad till he turned around. My Dad didn’t buy it, but he had no proof. He walked back to his glass box and hoped the air freshener would not live up to its odor fighting marketing. Back at his box my Dad pulled out all the stops and hoped the baked beans he’d eaten at lunch would come out in time. He looked upset and when I asked, he told me what happened. I was all for going straight to the judge, but we had no proof and everything would end up as his word vs ours. When the judge came to my Dad’s box he took a good whiff. Then he took a second deep whiff. He wrote something down on his clipboard and shook his head. Dad squeezed out one small “toot” as Mom calls them, but the judge only wrinkled his nose at the third and final whiff. The judge stepped up to Mike’s box and opened the stench hole. He took his first whiff and wrinkled his nose. He took his second whiff and his eyes started to water. On his third deep whiff his face turned a sickly shade of yellow. Apparently Mike had found his skunk. The judge didn’t need to write anything down. He proclaimed Mike the winner then ran off to the bathroom. Mike lifted his hands high and celebrated his victory. This was his highest achievement in thirty-seven years on this earth and he planned to revel in it. He left his box and ran in triumph into the cheering crowd of people flown in to clean up and de-stink the stinkiest man in the world. Once clean, he would spend a year crisscrossing the globe and professing the wonders of whatever deodorant, cologne or perfume he was told to. My Dad left his box as the second stinkiest man in the world. As I met him a tear rolled down his cheek. Back at our room he took a long hot shower. The water ran brown and black and yellow and back to brown. He washed off weeks of sweat and dirt and stench. He scrubbed his arm pits, his feet, and his face. It took him nearly an hour, but he scrubbed himself to a ruddy shine. He pulled out a sealed gallon bag that Mom had forced him to take, containing a clean set of clothes. He dressed himself and threw his old clothes in the trash. As we walked out we passed where the beauticians were hosing Mike down with a fire hose. We stopped for a minute to watch the process. They finished hosing him off and brought him to a second group who had prepared a baking soda and hydrogen peroxide wash to remove the skunk smell. Dad stepped forward to Mike and held his hand out for a shake. “Best of luck,” Dad said. Mike looked surprised. He took Dad’s hand limply and shook. Dad nodded at him, then turned and walked off toward me. My Dad stopped. He looked down at his feet, then over at Mike and the beauticians scrubbing him before looking back at me. “He needed it more than I did,” he said. “But he cheated,” I said. I didn’t understand, but Dad wouldn’t say more and couldn’t be brought out of his silence all the way back home. When we got off the plane and walked into the airport. Mom saw us coming and ran and jumped into Dad’s arms and kissed him. She hugged me too. She didn’t care how Dad smelled or that he hadn’t won. She loved and missed him. She did hope that he wouldn’t compete in any more stench competitions, but she said that whether he did or not, from now on she’d be there to support him. Synopsis: Who will be the world's stinkiest man?